Deane House Chef, Jamie Harling, credits his grandparents, as well as his time spent on a farm in Southwest France, for nurturing his passion for local, seasonal & sustainable food. Toronto born & raised, & a graduate of the George Brown College Culinary program, Jamie earned his stripes in the industry working at some of Toronto’s best restaurants, including Mark McEwan’s ‘Bymark’, and international stages at two Michelin starred “The Ledbury” in London, England and “McCrady’s Restaurant” in South Carolina. 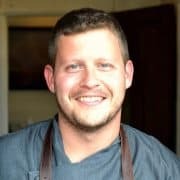 Jamie joined the team at the newly reopened Deane House in 2016, earning a spot in Canada’s 100 Best and enRoute Magazine’s longlist of Canada’s Best New Restaurants in its first year under his lead. Celebrating the best produce available, while respecting the ingredients on hand, Jamie exemplifies his strong belief in local & seasonal cuisine through his relationships with local purveyors, all to create a distinctly Canadian culinary journey.